The name 'Gutti Vankaya' itself makes my mouth water! I love this vegetable for two reasons, one it twists so well for all the different variations you try with it, two this is the only vegetable got the privilege to be pictured as romantic vegetable in our Telugu Literacy! I have tried several Gutti Vankaya recipes so far, but still my quest doesn't stop and I keep exploring more recipes with this vegetable. Today I am sharing this recipe, which is quite popular in Andhra region and this recipe will be cherished by non-veg lovers due to onion and other masala ingredients that are used. In this recipe, baby eggplants are stuffed with onion, green chili, red chili spices and simmered on low to medium heat until all the egg plants are cooked thoroughly. The best taste of his dish comes with only when it served with hot white rice. Here is the recipe, njoy! Grind Onion, Green Chili, Cilantro, Ginger, Garlic and Tamarind in a small mixie jar and blend into coarse paste. Now add red chili powder, coriander powder, garam masala powder to the onion paste and mix it well together and grind again until it becomes smooth paste. Wash egg plants, trim the edges and make 4 slits at the bottom making sure they are still intact at the top. (keep the eggplants in water to avoid them from browning). Stuff eggplants with Ulli Kaaram Masala and keep them aside. Take a wide pan and heat on stove on medium heat. Add Oil, once oil is hot, add cinnamon, clove and cumin seeds. As cumin start spluttering add stuffed eggplants to pan gently one-by-one. Keep them separate from each other allowing eggplants to be cooked on all sides. Keep rotating eggplants gently on all sides and saute them for 5 min. Now add remaining Onion Masala paste to pan and distribute evenly. Cover the lid, reduce the heat to low and simmer for at least 15 to 20 min. 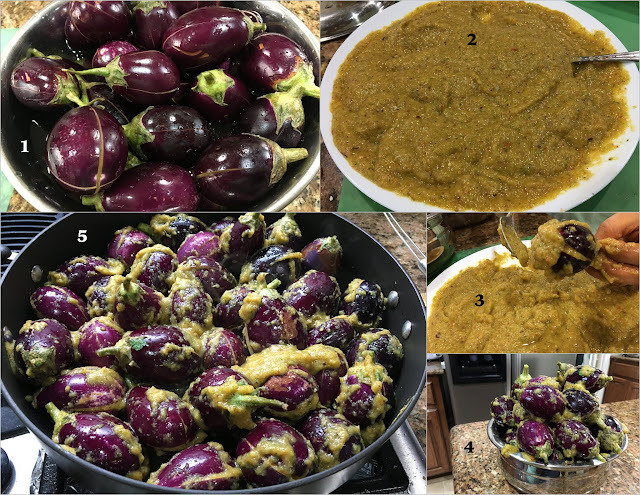 After 20 min, remove lid and you notice egg plants are fully cooked becoming tender and masala comes together. Increase heat to medium to high and cook for another 10 min for all the gravy to come thick and together. Switch off the stove and transfer Stuffed Brinjals to serving bowl and serve hot with White Rice. Oh!How I miss Andhra food. I am a Tamizh though, but I ve spent considerable years of childhood in Hyderabad and it reminds me of all those lovely dishes. Three cheers.